our world premiere production returns for six additional performances! What is “identity”? What makes us who we are? Who has the right to define us? 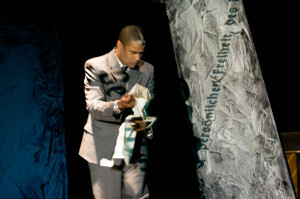 Set in 1938 Berlin and drawing heavily upon history, the play imagines a story that examines universal questions of self and citizenship primarily through the eyes of a patriotic Afrodeutscher (Afro-German) actor. Proud to serve his country, he appears in propaganda films calling for the return of Germany’s former African colonies. An encounter with an African-American musician and activist leads to hard questions about the treatment of people of color both in Germany and in the United States of America. Schwarz gemacht is the first project to move completely through English Theatre Berlin | International Performing Arts Center’s new work development series, THE LAB, to receive a full production. It was part of the Colorblind? series of staged readings examining racial identity on stage in 2012 and a two-week workshop was held in December 2013. Post-performance discussions with the artistic team and cast will be offered on Friday, April 17 and Friday, April 24. The event on April 17 is offered in conjunction with Theaterscoutings Berlin. The post-performance discussion on Friday, April 24 features playwright Alexander Thomas and will be moderated by Sharon Dodua Otoo, independent writer and editor of the Witnessed Series at Edition Assemblage, an English-languages series dedicated to the work of Black authors who have lived in Germany. Alexander Thomas was born and grew up in Albany, New York. He studied acting in New York City at the Stella Adler Studio (among others). His autobiographical solo show Throw Pitchfork ran off-Broadway at New York Theatre Workshop as well as the Kitchen Theatre Company in Ithaca, New York. Throw Pitchfork won a Special Honours Award and was the closing production at the 2004 Thespis International Monodrama Festival in Kiel, Germany. He is one of the contributing writers to the American Slavery Project; Unheard Voices, a monologue play that gives voice to some of the 400 unmarked graves of slaves discovered at the African Burial Grounds unearthed in Manhattan, New York in 1991. This project has been performed in venues throughout New York including the Museum of Natural History. Alexander Thomas has an international career as a stage actor. He was a cast member of the award-winning UK production of On the Waterfront by the esteemed director Steven Berkoff which ran in London’s West End as well the Edinburgh Festival, the Nottingham Playhouse and the Hong Kong Arts Festival. Schwarz gemacht featured on sugarhigh!